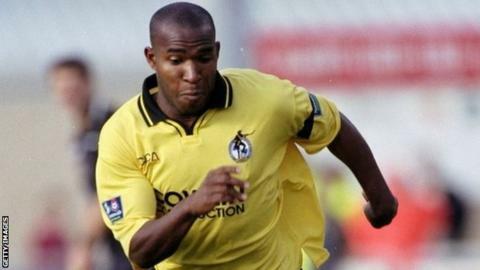 Veteran striker Barry Hayles is anticipating his return to Bristol Rovers in the FA Cup first round - 17 years after leaving the club. League Two Rovers host seventh-tier side Chesham United in November. Hayles, 43, who scored 32 goals in 62 appearances for Rovers, signed for Chesham as a player-coach after leaving Truro at the end of last season. "Great FA Cup draw going back to Bristol Rovers," former Fulham forward Hayles posted on Twitter. Hayles, who has also played for Plymouth and Leicester, established himself as a firm fans' favourite at Rovers before joining Fulham in 1998. Rovers manager Darrell Clarke told the club website: "I am certain that supporters will welcome Barry Hayles back to the ground where his league career took off. "We will not treat the game lightly and look forward to hosting Chesham in the best cup competition in the world."